Will You Take Me as I Am: Joni Mitchell’s Blue Period is the most engaging book about music to be published in some time. On the surface, it not only seemed to be another tedious exercise in myth-building, but it also appears to be designed for the sole purpose of wrestling money from those aging baby boomers who never tire of reading about icons from the 1960s. In truth, Will You Take Me as I Am: Joni Mitchell’s Blue Period is much more than this. Will You Take Me as I Am: Joni Mitchell’s Blue Period was written by Michelle Mercer, an NPR reporter as well as the author of Footprints: The Life and Work of Wayne Shorter, a critical appreciation of the legendary saxophonist. The most refreshing thing about her approach to Will You Take Me as I Am: Joni Mitchell’s Blue Period is that even though she is a fan of Joni Mitchell’s work, Mercer challenges the songwriter at every turn, taking almost nothing that she says at face value. The respect between the author and her subject is palpable. Mercer and Mitchell obviously developed a solid relationship during the construction of the book, and they jostle and argue about everything from Saint Augustine to the purpose of confessional writing. 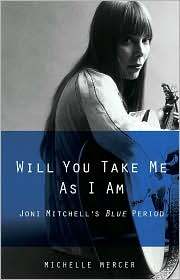 With Will You Take Me as I Am: Joni Mitchell’s Blue Period, Mercer made the unusual choice of inserting herself into Mitchell’s story. This might have been a risky decision, yet it also is what makes the book so compelling. Mercer begins her tale by confessing that she used Mitchell’s Blue to test potential boyfriends. Later, when she found that this wasn’t a novel idea, she began to realize that there was something essential about this period in Mitchell’s work that merited further exploration. Mitchell is famously grouchy with the press, and this side of her persona is evident throughout Will You Take Me as I Am: Joni Mitchell’s Blue Period. Mitchell aggressively de-constructs many of the prevalent myths about her life and work. Thankfully, the portrait that emerges is more complex and ultimately intriguing than has previously been offered. The personal idiosyncrasies that prevent Mitchell from relaxing into middle-age, where she can enjoy the fruits of her labor, might baffle some readers. Nevertheless, Mercer makes a convincing argument that Mitchell’s prickly personality is precisely what has allowed her to delve so deeply into her interior realm while creating her greatest music.